Last week was a busy one. Delightfully so, but busy. 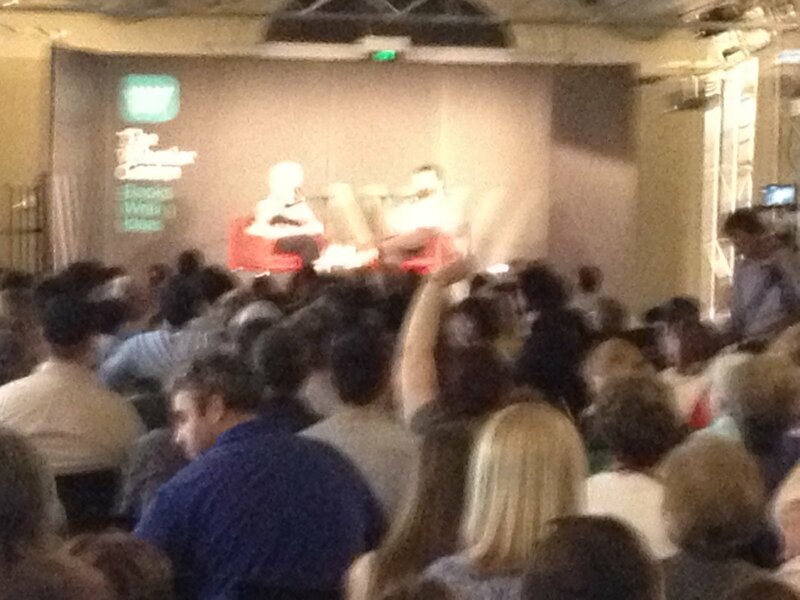 Monday, was a Literature Festival in Carlton. I was there early and went for a walk. I like to have a look around where I’ll be working, it grounds me somehow. 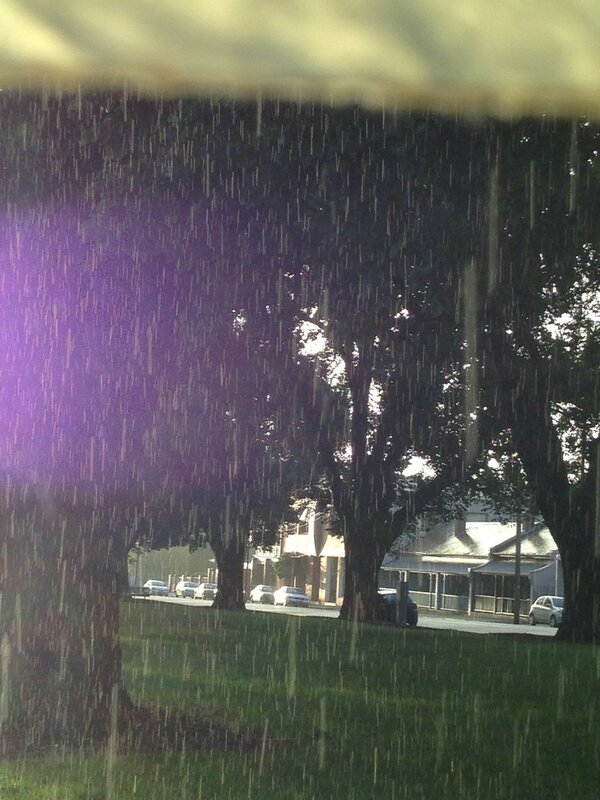 I took my brolly, on the off chance that the grey clouds opened. The classroom I was in was the scene of interrupted work about bees. There were bee bits buzzing everywhere, even some honeycomb. I didn’t touch it. I promise I didn’t check to see if it was nice honey. Thursday evening Patricia Mullins received the Dromkeen Medal, and there was a presentation in the State Library. 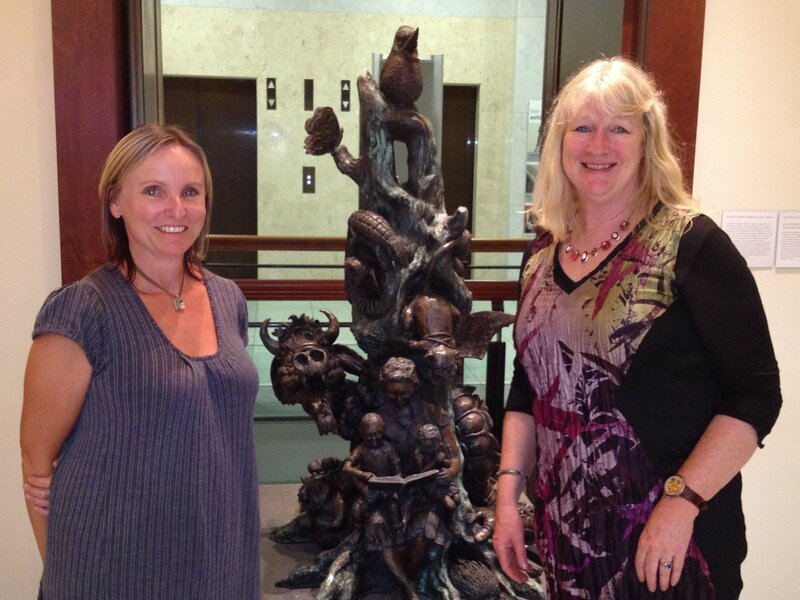 Here, Jackie Hosking and Meredith Costain are flanking the newly installed sculpture that once graced Dromkeen. Friday, I was in Fawkner as part of the Books in Homes program, presenting preps with their books and bags. They knew it was my birthday and sang me Happy Birthday, gave me a birthday sticker and a large envelope full of birthday greetings. Gorgeous. 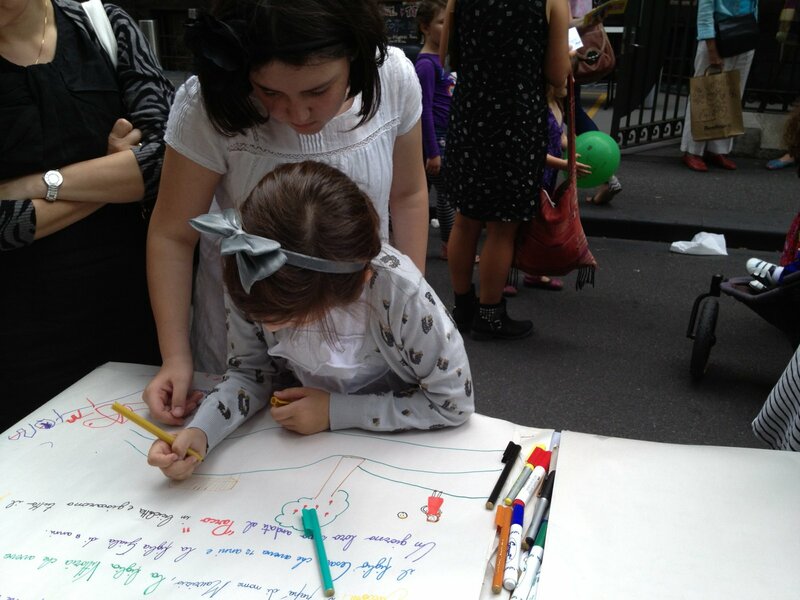 Sunday was the SLV Children’s Book Festival. 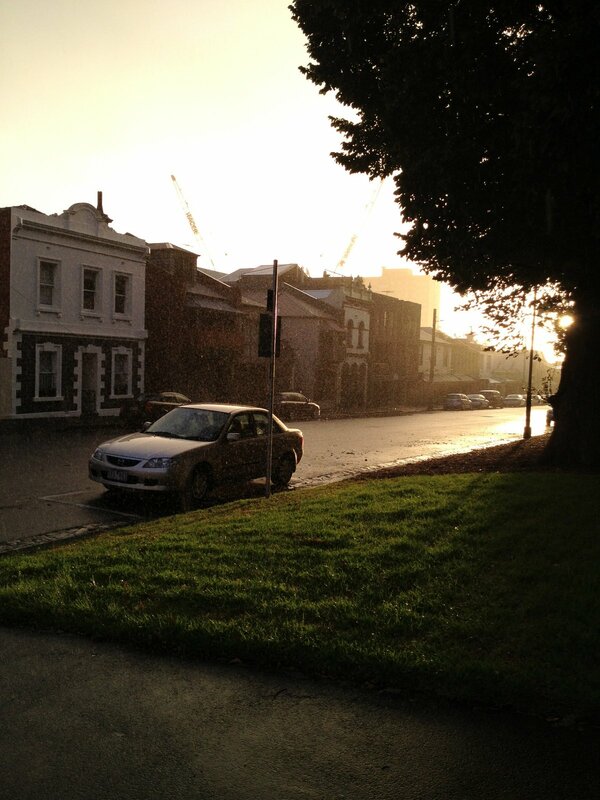 I was early for my gig outside the CBCA tent so I did a bit of wandering. I peeked into the Lynley Dodd session, called by the Random House tent, waved to Janeen Brian as she made Ned Kelly masks, and chatted to Nick Falk and Tony Flowers about all things dinosaur. This young lady (sorry about the pic, I hope she’ll forgive me) was delightful. She and her sister (below) contributed to the Continuous Story, by writing in Italian. Actually Anna Livia (I hope I’ve got that right) wrote in Italian, then English, then Portuguese. Amazing. 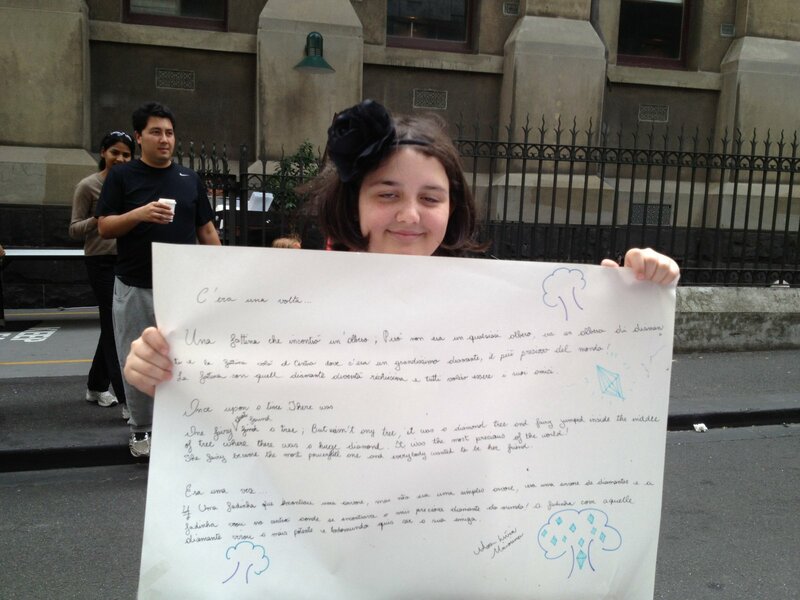 Chiara also illustrated her story. It was fabulous to watch the creative minds at work. Afterwards, I went to see the final performance of Jersey Boys. Fascinating to hear the story behind the success. Today, it’s been head down, tail up, racing at deadlines. 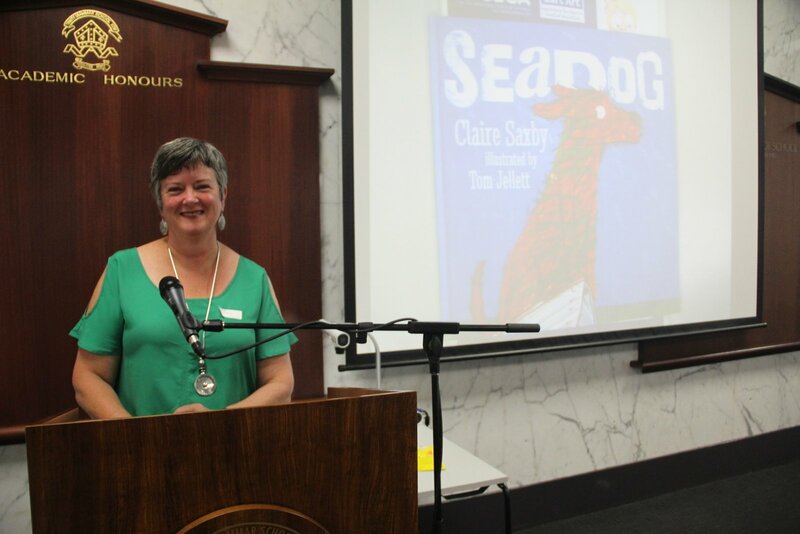 Last night Catriona Hoy and I joined Pam McIntyre, Susanne Thwaites and Pam Horsey (channelling her inner Bec Kavanagh) presented our Clayton’s shortlist titles to a gathering of bookpeople at the CBCA Vic Clayton’s Night. 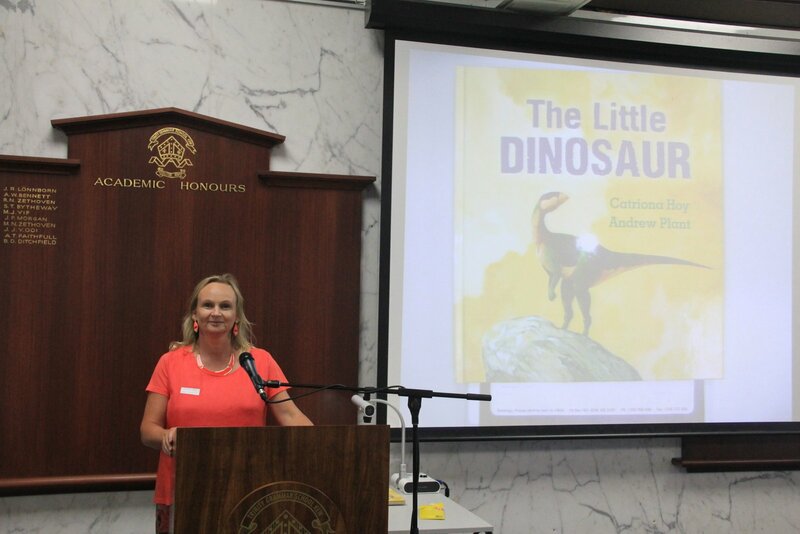 I was presenting the Early Childhood section and Catriona, the non fiction. Knowing that it’s almost impossible to catch a closed-mouth photo of a speaker, these are two shots we prepared earlier.